Nutria helps determine the customized meal plan for your individual needs and genetic profile. You'll learn how to eat smart and enjoy your food without a drastic lifestyle change. Nutria rebalances your meal plan to keep you on track and finish each week feeling great. Your genetic markers help determine your customized nutrient intake for each meal recommendation. Focus on for more energy as part of a healthy lifestyle or targeting specific weight loss; Nutria lets you set your own goals. Nutritious recipes, prepared meals and recommendations at nearby restaurants. Easily track what you eat outside your plan by taking a photo. Nutria will learn which foods you enjoy the most. Guidance from skilled nutritionists who help educate and motivate you to achieve your goals. Enjoy dining out by seeing which meals are recommended for you at nearby restaurants. 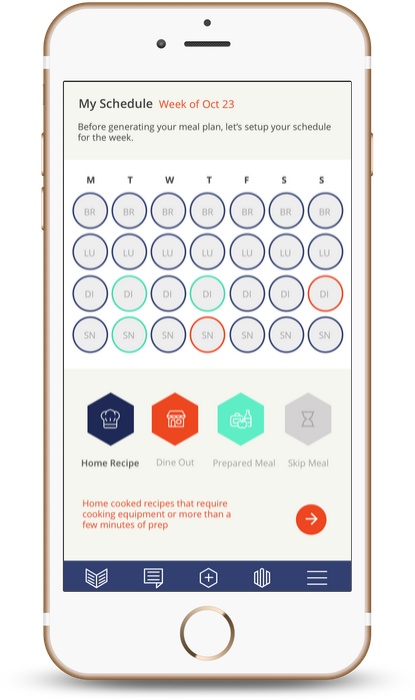 Nutria's mobile app is the central location for your weekly meal plans, meal recommendations and access to your nutrition coach. 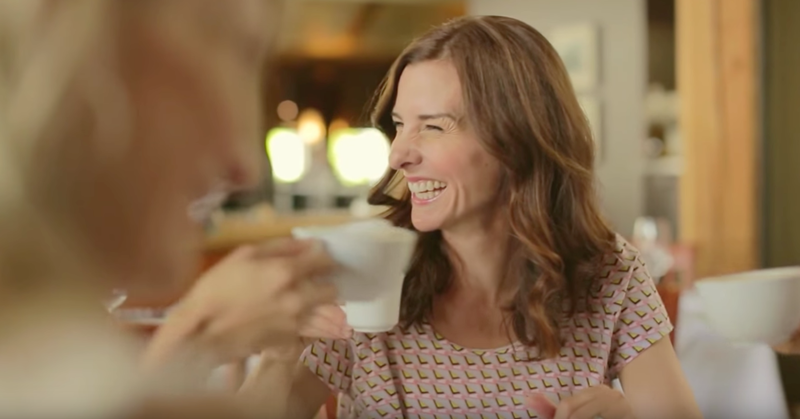 Plans adapt each week to your personal preferences, eating habits and favorite meals. Access to your coach to receive daily motivation, challenges and education to help you achieve your goals. 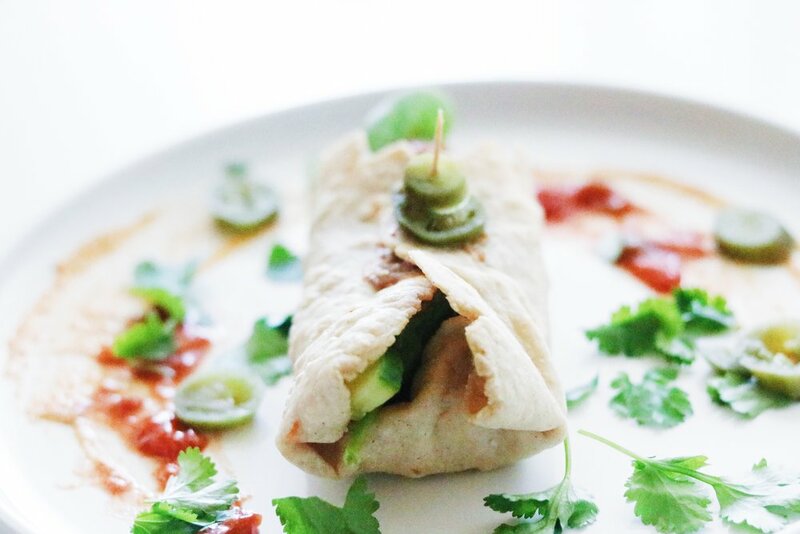 Track what you eat off plan by just taking a photo. Nutria will determine the nutrition content. 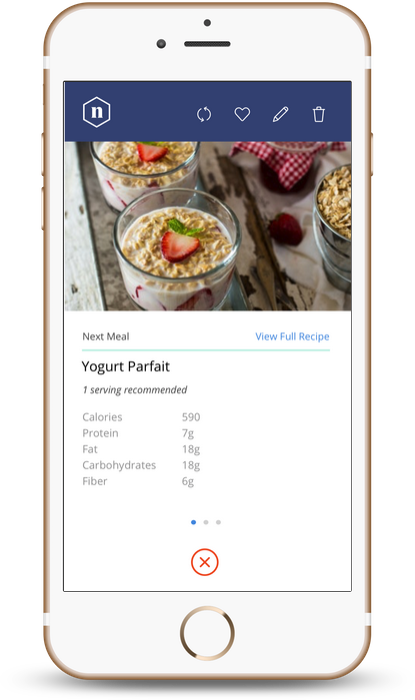 Access thousands of nutritious meal recommendations optimized to your taste and genetic profile. Customize your daily calorie and macronutrient amounts to help you reach your goals even faster. Nutrigenomics is the study of how foods affect our genes and how individual genetic differences can affect the way we respond to nutrients (and other naturally occurring compounds) in the foods we eat. Nutria utilizes the science that applies genomic information and advanced technologies to uncover the relationship between genes, nutrition and human health. We collaborate with Caligenix, a biotechnology company, to offer you state of the art DNA testing. Vitamins are an important part of nutrition. Our test includes genetic markers associated with your likelihood of having lower levels of certain antioxidants and nutrients such as folate and vitamins A, B12, C, D and E.
Being overweight or obese is linked to many health conditions. Obesity leads to negative impacts on a person’s metabolic system, such as decreased levels of HDL cholesterol and elevated levels of LDL cholesterol, as well as elevated blood sugar and triglycerides. The adverse metabolic effects are precursors to metabolic syndrome, as well as health conditions such as coronary artery disease, stroke and type 2 diabetes. Your weight may be influenced by many genes. Our test includes genetic markers associated with metabolism, the tendency to regain weight after losing it, as well as a predisposition to obesity. How you may respond to some foods may be linked to your genetics. We currently screen for genes related to caffeine, sweet taste, as well as gluten and lactose intolerance. Eating behaviors can have as much effect on health as our diet. Some of our behaviors are learned over time and some are influenced by our genetics. 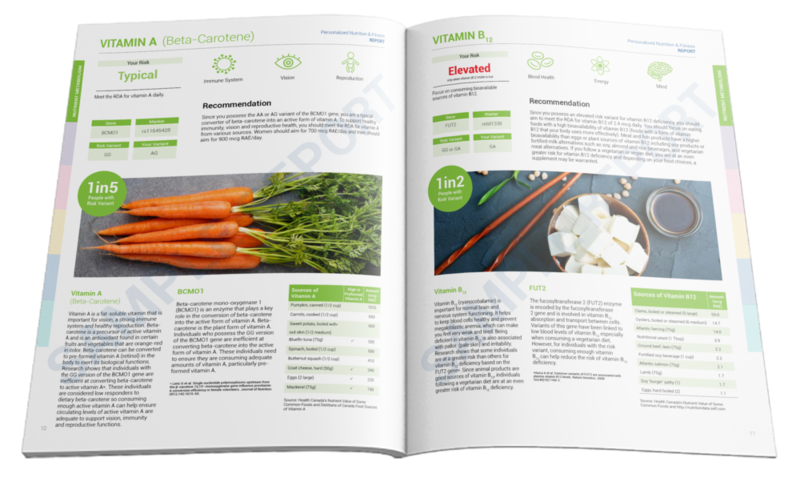 The DNA Nutrition & Fitness Report describes certain genetic markers that are associated with eating behaviors, and with this information, you can modify your lifestyle to help you achieve or maintain wellness. Exercise has long been shown to provide many health benefits. Many studies have shown a link between genetics and exercise. Your genes may affect your chances of losing weight, having improved cholesterol levels, and other health benefits in response to exercise. Caligenix tests for a number of genes related to exercise and optimal performance. Our genetic test is based on peer-reviewed research by experts in the field of nutrigenomics. All saliva samples are processed in CLIA-certified and CAP-accredited labs. Our DNA collection kit is FDA-cleared for use with our genetic test.